Frustrated by evidence of recent upticks in migrant apprehensions at the U.S. Southwest border—and by the imagery of a caravan of Central Americans making their way north—the Trump administration recently unveiled dramatic policy changes to stem the flows. These include a de facto policy of separating families apprehended between ports of entry, possibly housing the children on military bases, as well as changing the definition of who qualifies as an unaccompanied minor. The administration also announced that all those apprehended crossing the border illegally will be criminally prosecuted for illegal entry or re-entry. The changes will send a strong message to all migrants traveling to the border without prior authorization to enter—including those who plan to cross illegally to apply for asylum—that they will not be welcomed into the United States. Meanwhile, the moves will likely add to the backlogged immigration caseloads of the federal courts in border states, further strain the limited capacity of the immigration detention system, and face legal challenges. They also could potentially divert migrants to ports of entry, where the new changes do not apply, adding more traffic to already-bustling official crossings. The President’s frustration about the rise in apprehensions was on full display at a May Cabinet meeting, where he reportedly lashed out at Homeland Security Secretary Kirstjen Nielsen. Rising unauthorized crossings, if they persist, would sharply undercut the narrative Trump has carefully honed: that muscular enforcement actions undertaken by his administration have made a significant dent in illegal immigration. Though apprehensions have declined under Trump, the downward trend has been ongoing since a sharp drop began in fiscal year (FY) 2007 as the U.S. economy softened and plunged into recession. Apprehensions in FY 2017 fell to just under 304,000, the lowest point since 1971—and a far cry from the peak of 1.6 million in FY 2000. In recent months, apprehensions have begun to rise slightly again, indicating that they may be returning to the 330,000 to 480,000 level seen in FY 2010 through 2016. Another trend first noted during the Obama administration has continued under Trump: The majority of migrants apprehended at the Southwest border are from El Salvador, Guatemala, and Honduras. This has been the case in the past four fiscal years, with the exception of FY 2015, reversing a decades-old trend of majority-Mexican crossings. The President’s new policies thus will primarily affect Central Americans, many of whom apply for asylum after fleeing violent conditions and deep poverty in their countries. On April 7, Attorney General Jeff Sessions announced that the Justice Department would prosecute everyone U.S. Customs and Border Protection (CBP) apprehends crossing the border illegally, without exception. Under this zero-tolerance policy, adults apprehended between ports of entry will be transferred to the custody of the U.S. Marshals Service (USMS), tried in criminal court for the misdemeanor of illegal entry and/or the felony of illegal re-entry, sent to federal jail or prison to serve their sentence, and then handed back to U.S. Immigration and Customs Enforcement (ICE) to be removed from the country. This move builds on an earlier action by the Justice Department. In April 2017, Sessions issued a memo instructing federal prosecutors to prioritize immigration crimes. In the first six months of FY 2018, there were almost 36,000 new immigration prosecutions, suggesting that the year-end total could reach about 72,000, compared to 60,000 in FY 2017 and 70,000 in FY 2016, according to the Transactional Records Access Clearinghouse (TRAC) at Syracuse University. The number could rise further yet if the administration can successfully implement its zero-tolerance policy. Though this blanket policy of prosecuting every unauthorized entrant is new, previous administrations have attempted to increase prosecutions. Past policies were also intended to address “catch and release” (the practice of releasing certain apprehended migrants, with a notice to appear in immigration court) and reduce repeat crossings. Operation Streamline, launched in 2005 by the George W. Bush administration in Texas’ Del Rio border sector, aimed to increase immigration prosecutions in response to an uptick in non-Mexican border crossers. DHS increasingly had to release these migrants from detention due to space limitations. Between 2003 and 2005, criminal prosecutions of first-time unauthorized crossers for illegal entry more than quadrupled, from 4,000 to 16,500. By 2010, they had reached 44,000, an 11-fold increase from 2003, while prosecutions for other immigration charges increased just 9 percent (excluding illegal re-entry, which tripled in that time). Previously, CBP had mainly referred for prosecution migrants who had prior criminal convictions or those suspected of smuggling. Under Operation Streamline, hearings were often conducted en masse, with up to 80 defendants being sentenced at once. The program had somewhat more flexibility than the one announced by the Trump administration. In some border sectors, CBP attorneys were deputized as federal prosecutors to relieve pressure on U.S. Attorneys who saw significant jumps in their caseloads. Sectors could also choose how to prioritize prosecutions, and some chose not to participate in Streamline at all: By the end of 2014, just three out of nine sectors were participating, according to a Department of Homeland Security (DHS) Office of Inspector General report. Further, parents traveling with children were rarely referred for prosecution. Streamline continued through the Obama administration, and remains in place today. Criminal immigration prosecutions reached a peak of 97,000 in FY 2013, although first-time crossers were not prioritized. Because immigrant children apprehended at the border cannot legally be held in federal criminal detention facilities, they will inevitably be separated from their parents when the adults are criminally prosecuted. Children will be referred to the Office of Refugee Resettlement (ORR), the agency within the Department of Health and Human Services (HHS) that handles unaccompanied minors, and will be treated as though they arrived on their own. ORR will release them to an adult sponsor in the United States (a relative or family friend) if one is available, and if not, to a foster family; otherwise, the children will be held in an ORR shelter. The Obama administration generally detained families together in ICE custody (which is administrative, not criminal), or released them with a notice to appear in immigration court. During his campaign, Trump promised to end the practice of releasing families, unaccompanied children, and asylum seekers, vowing to detain them. In a January 2017 executive order, the President ordered DHS to do just that, but the agency has since been constrained by laws and court settlements that protect vulnerable populations. Even so, since Trump took office, there have been some shifts in how families apprehended at the border are treated. Before word of the zero-tolerance policy, CBP had started to increase referrals for criminal prosecution of illegal entry, including of parents. ICE and CBP have also continued a policy of separating parents from children in some cases to investigate the legitimacy of the parental relationship, which it says may be necessary to protect minors from trafficking. As families have begun to make up a larger share of unauthorized flows, the government has faced two barriers to ending “catch and release”: strict legal protections for child migrants and insufficient detention capacity. The 1997 Flores v. Reno court settlement, which remains in effect, requires the government to release children from immigration detention without unnecessary delay to, in order of preference, parents, other adult relatives, or licensed programs willing to accept custody. If children cannot be released, Flores requires the government to hold them in the “least restrictive” setting available. The 2008 Trafficking Victims Protection Reauthorization Act (TVPRA) codified parts of the settlement into federal law. In 2015, U.S. District Judge Dolly Gee of the Central District Court in California ruled that the Flores requirements apply to both unaccompanied minors and children apprehended with their parents, meaning that all minors must be released from detention if possible. Gee also ordered DHS to release parents detained along with their children. An appeals court in 2016 affirmed that Flores applied to all children, but reversed the ruling that parents should be released as well. By referring parents for criminal prosecution—funneling them into the Justice Department’s correctional system, separate from ICE detention—the Trump administration may bypass the limitations of the family detention system, which currently has the capacity to hold just 2,700 people at a time. In addition to criticizing “catch and release,” Trump administration officials have assailed what they call “loopholes” in current law for child migrants, and have sought to limit who can qualify for protections. TVPRA provides some unique protections to unaccompanied minors who are nationals of noncontiguous countries (including those in Central America). Such minors must be placed in the care of ORR and are put in long-term removal proceedings. Further, those seeking asylum are given two chances to apply, first through U.S. Citizenship and Immigration Services (USCIS) in a nonadversarial process, and if denied, via the immigration courts. Eligibility for these protections depends on the determination that a migrant is an unaccompanied minor. As originally defined by the Homeland Security Act of 2002, and adopted by TVPRA, an unaccompanied minor is a child under age 18 who either has no parent or legal guardian in the United States, or none available to provide care and physical custody. Determinations of this status are made by CBP or ICE when deciding whether to transfer the child to ORR custody. Under 2009 guidance issued by the Obama administration, if unaccompanied minors (as classified by CBP or ICE) applied for asylum, USCIS asylum officers were to make independent determinations of their unaccompanied minor status. In 2013, new guidance instructed asylum officers to adhere to the first determination, even if evidence to the contrary surfaces, thus expanding the population that would retain this classification. The Trump administration is clearly seeking to restrict who qualifies. In September 2017, the General Counsel of the Executive Office for Immigration Review (EOIR), the Justice Department entity in charge of the immigration courts, issued a legal opinion that immigration judges may make their own unaccompanied minor determinations—and those deemed not unaccompanied would lose TVPRA protections. This opinion seems to have paved the way for a proposed DHS regulation, leaked in draft form to the Washington Post, requiring immigration judges to make the determination before the case is sent to an asylum officer, possibly with the goal of filtering out fraudulent cases faster and more thoroughly. The administration has also indicated that it does not believe children who arrive alone to reunite with parents already in the United States meet the definition of unaccompanied minors, a position contrary to that of the last two administrations. Will These Policy Changes Meet their Goals? In the first few days with the new policies in place, caseloads at federal courts in Texas have already increased, according to the Los Angeles Times. And at the McAllen court, 29 of the 212 immigrants prosecuted in the first three days were parents who had been separated from their children following apprehension, compared to the one or two cases a public defender said he saw weekly prior to these policies. Despite these increases, significant barriers may prevent the administration from meeting its goal of reducing the current levels of unauthorized border arrivals. First, the policy of criminally prosecuting everyone apprehended faces resource limitations. TRAC reports that immigration prosecutions already constituted more than half of all federal criminal prosecutions in 2016, and in FY 2017, immigration offenses made up half to three-quarters of all sentences in the five federal courts in the border region. Because most of these crimes are relatively low-level, some judges and prosecutors criticize the policy for redirecting resources away from more serious cases. Although the Justice Department sent 35 additional prosecutors to the border, courts would still be limited by the number of federal judges and defense lawyers (both public defenders and private lawyers hired by courts) available, as well as the number of U.S. Marshals needed for transportation and security. The resources of federal courts would have to be significantly increased to meet the new demand. In terms of detention, the Marshals Service and immigration detention facilities would feel the most strain, unless Congress appropriates additional funds. As of 2015, 90 percent of noncitizens sentenced through Operation Streamline served their time in USMS custody. USMS projected an increase of 19,000 prisoners—two-thirds at the Southwest border—between FY 2017 and 2019 due to the increase in immigration prosecutions. Congress only slightly increased ICE detention bed funding in FY 2018, and though it boosted funding for USMS detention by $82 million, it is not clear that this will be sufficient to meet increased demand. Separation of families will lead to a need for increased space at ORR shelters, which typically house only unaccompanied minors. ORR shelters currently have a combined capacity of 10,600 beds, 91 percent of which were filled as of mid-May. According to media reports, however, HHS is considering housing unaccompanied and separated children at military bases, which would relieve pressure on ORR shelters. Military bases have served as accommodation for child migrants in the past, in response to unforeseen surges in arrivals. Litigation will also affect the outcome of family separation. In March 2018, the American Civil Liberties Union (ACLU) filed a class-action lawsuit in federal court in California challenging the DHS policy of separating parents from their children absent a demonstration that the parent is unfit or presents a danger to the child. Further, the policy of prosecuting all border crossers—which only applies to those apprehended between ports of entry, since presenting oneself at an entry point is not a crime—could have the unintended consequence of diverting many more families to ports of entry. In the first six months of FY 2018, 40 percent of families attempting to enter the United States did so this way, while 60 percent were apprehended trying to cross illegally. (For comparison, 20 percent of unaccompanied minors turned themselves in at ports of entry.) Nielsen, the Homeland Security Secretary, has also encouraged families to use ports of entry if they want to claim asylum and wish to avoid prosecution. Finally, although the new regulation regarding unaccompanied minors is not finalized, it is clear that funneling these children into the immigration court system will inevitably increase the burden on the courts at a time when the backlog is already a staggering 698,000 cases. These challenges, together with the continued violence, insecurity, and poverty in the region, make it unlikely the policy changes will succeed in drastically cutting immigrant arrivals. Seven States Sue Federal Government, Arguing DACA Is Unlawful. A group of states led by Texas sued the federal government on May 1, challenging the lawfulness of the Deferred Action for Childhood Arrivals (DACA) program launched by the Obama administration in 2012. The suit argues that the executive branch did not have the authority to unilaterally implement DACA, which offers work authorization and relief from deportation to unauthorized immigrants brought to the United States as children. On May 15, the federal judge hearing the case in the U.S. District Court for the Southern District of Texas allowed 22 DACA recipients, represented by the Mexican American Legal Defense and Educational Fund (MALDEF), to be added as defendants in the case, after they argued that the Trump administration could not be relied upon to defend DACA. The move is the latest attempt by states to challenge the legality of DACA, after Texas Attorney General Ken Paxton last year threatened to sue the federal government if Trump did not rescind the program—prompting the administration to attempt a DACA phaseout, which has since been stymied by court decisions. The federal judge in the case, Andrew Hanen, ruled in 2015 against implementation of the Deferred Action for Parents of Americans and Lawful Permanent Residents (DAPA) program and a DACA expansion, which President Obama had created via executive order to broaden the population protected from deportation. If Hanen enjoins the government from continuing the existing DACA program, the Justice Department and the Department of Homeland Security (DHS) will have to reconcile that order with those from three other federal courts requiring U.S. Citizenship and Immigration Services (USCIS) to continue processing DACA renewal applications. May 1, 2018 complaint by Texas and six other states in Texas et al. v. United States et al. Judge Hanen’s 2015 order for preliminary injunction in Texas et al. v. United States et al. Moderate Republicans Try to Force Votes to Protect DREAMers. On May 9, a group of five moderate Republicans, led by Rep. Jeff Denham of California, filed a discharge petition in an attempt to force the House to vote on four immigration bills. If it secures the required 218 signatures, the petition would bypass House Speaker Paul Ryan (R-WI), who otherwise decides which bills are taken up for a vote and would mandate their consideration. The four bills are the Securing America’s Future Act, which would boost border security and authorize funds for a wall, change asylum laws, reduce avenues for permanent residence, and provide a temporary, renewable legal status for DACA recipients, without a path to permanent residence; the DREAM Act, which would provide a path to citizenship for some unauthorized immigrants who came to the country as children; the USA Act, a bipartisan bill that would also provide a path to citizenship for some DREAMers and increase the deployment of border security technology; and a fourth bill of the Speaker’s choosing. Once brought to the floor, the House would vote on the bills in sequence. And under the “queen of the hill” rule, whichever bill gets the most votes passes, as long as it is more than a majority. House leadership disapproves of the move, saying there is no point voting on bills that the President will veto. As of May 23, the petition had 203 signatures, including 20 Republicans. If all Democrats sign the petition, 25 Republican signatures are needed for it to take effect. DHS Ends Temporary Protected Status for Hondurans and Nepalis. Within recent weeks, DHS has announced it is ending Temporary Protected Status (TPS) for nationals of Nepal and Honduras. TPS for Nepalis will end on June 24, 2019, and for Hondurans on January 5, 2020. Some 15,000 Nepalis and 86,000 Hondurans will be expected to voluntarily leave the country or else become subject to deportation. The program provides work authorization and protection from deportation for foreign nationals in the United States from countries that DHS determines to be unsafe for return due to armed conflict, environmental disaster, or other temporary conditions. Nepalis became eligible for TPS following a 2015 earthquake, and Hondurans were designated in 1999 after a hurricane. All Hondurans with TPS have thus been in the United States for almost two decades, and have seen their TPS renewed time and again. This time, DHS, with input from the State Department, argued that conditions directly resulting from the hurricane no longer existed. Currently, 437,000 nationals of ten countries hold TPS, and the Trump administration has announced gradual terminations of protections for 98 percent of this population. USCIS Changes Visa Rules for Students and Exchange Visitors. USCIS issued a policy memorandum on May 11, announcing that students and exchange visitors—those on F, J, and M visas—would automatically start accruing unlawful presence in the United States if they fail to maintain their status. Previously, this began when an immigration judge ruled they were out of status. These visa holders will now be in violation of their status, for example, if they stop taking classes in their authorized program, work without authorization, or complete their course of study and any subsequent practical training. Once someone has accrued 180 days of unlawful presence, they are barred from returning to the United States for three years if they leave the country, and after one year of unlawful presence, they are barred from returning for ten years. Central American Migrant Caravan Members Ask for Asylum in United States. From April 30 to May 4, U.S. Customs and Border Protection (CBP) allowed at least 228 Central American migrants who arrived as part of the migrant caravan to enter the San Ysidro port of entry, on the California border, to seek asylum. USCIS Director Lee Francis Cissna told members of Congress that in total, 330 migrants from the caravan turned themselves in at ports of entry. As of May 22, 216 had undergone credible-fear screenings—the first step in the asylum process—and of these, 205 were determined to have a credible fear of persecution in their home countries and will move on to the next step in the process. The caravan had started with more than 1,000 migrants, but dwindled after it reached Mexico, with some deciding to stay and seek protection there. Relatedly, CBP apprehended 11 alleged caravan participants illegally crossing the Southwest border. The Justice Department announced it would criminally prosecute the migrants for the crimes of illegal entry or re-entry. Attorneys for six of those being prosecuted argue that they were singled out because they were Central American, whereas Indian nationals apprehended at the same time were not prosecuted. Acting ICE Director Retires. Acting U.S. Immigration and Customs Enforcement (ICE) Director Tom Homan announced April 30 that he would retire from the agency. Homan served as Acting Director since shortly after President Trump took office, and in November 2017 Trump tapped him to be Director, though the nomination was stalled. His announcement came the day he was set to receive a leadership award, and days after 18 Senate Democrats wrote a letter asking DHS for documents related to the delay in proceeding with the nomination. Connecticut and New Jersey Increase Financial Aid Opportunities for Unauthorized Students. Connecticut and New Jersey recently enacted laws that make unauthorized immigrant students eligible for financial aid to attend higher education institutions. On April 27, Connecticut’s Democratic Governor Dannel Malloy signed a bill allowing unauthorized students enrolled at state colleges and universities who attended a Connecticut high school for at least two years to apply for institutional financial aid. Unauthorized immigrants who are honorably discharged veterans will be able to apply for the aid immediately, and all other unauthorized immigrants can apply starting January 1, 2020. New Jersey’s Democratic Governor Phil Murphy signed a bill on May 9 that expands state financial aid eligibility to unauthorized students who attended a New Jersey high school for at least three years, and either graduated from a state high school or received the equivalent of a high school diploma. The law takes effect immediately for the 2018-19 academic year. Ten states now offer financial aid to unauthorized students. Tennessee Expands Ban on Sanctuary Cities. On May 21, Republican Governor of Tennessee Bill Haslam chose not to sign, but allowed to go into effect, a bill requiring further local cooperation with federal immigration authorities. The law, effective immediately, expands a 2009 state law banning local “sanctuary” policies that limit communication or cooperation with federal immigration authorities. The amended law prohibits policies preventing law enforcement agencies from asking people about their immigration status, and restricts the distribution of state funds to jurisdictions with such policies. It also requires compliance with ICE detainers—requests to hold an inmate for up to 48 hours past their release date so ICE can take custody of them. Oregon Laws Make Access to Driver’s Licenses, In-State Tuition Easier for Some Immigrants. Oregon Governor Kate Brown, a Democrat, signed two bills into law on May 1 relating to immigrants in the state. One would allow DACA recipients and TPS holders to renew their driver’s licenses without having to provide proof of lawful presence. Under this law, if someone held DACA or TPS and lost it due to the Trump administration’s actions, but had obtained a license, they could remain eligible to renew the license. The other law removes a requirement that immigrant students who were not lawful permanent residents or citizens had to apply for official federal identification, such as DACA, to be eligible for in-state tuition. California Cities and Counties Join Both Sides of Lawsuit against State’s Sanctuary Laws. Local jurisdictions in California are choosing sides in the lawsuit brought against the state by the Justice Department, challenging state laws that limit local cooperation with ICE. At least 10 cities and two counties—Orange and San Diego County—are officially supporting the Trump administration’s lawsuit. Orange County filed a motion to intervene as a plaintiff in the lawsuit, and the City of Huntington Beach filed its own lawsuit against the state. On the other hand, 23 other cities and counties, led by Santa Clara County, Los Angeles County, and the City of Oakland, filed a brief supporting the state. New Hampshire State Court Finds 2017 Border Patrol Checkpoint Unconstitutional. A New Hampshire state court judge found that an interior checkpoint set up by CBP in summer 2017, ostensibly to screen for immigration violations, was instead intended to search for drug violations, a function prohibited by the Fourth Amendment. The judge ruled that the searches, conducted by CBP in collaboration with the local police department, were unconstitutional under the state constitution, which prohibits searches without reasonable suspicion of a crime. Concord Monitor article on State of New Hampshire v. Daniel McCarthy et al. Sheriffs Who Oppose Cooperation with ICE Win North Carolina Primary Races. Two sheriff races in North Carolina will likely have significant implications for local immigration policies. The winner of the Democratic primary for sheriff in Mecklenburg County—who is uncontested in the general election—ran on ending the county’s 287(g) agreement, which allows local law enforcement officers to be deputized as federal immigration officers and help identify removable noncitizens in county jails. In Durham County, the winner—also uncontested in the general—promised to stop honoring ICE detainers, while the incumbent sheriff had promised that cooperation would continue. 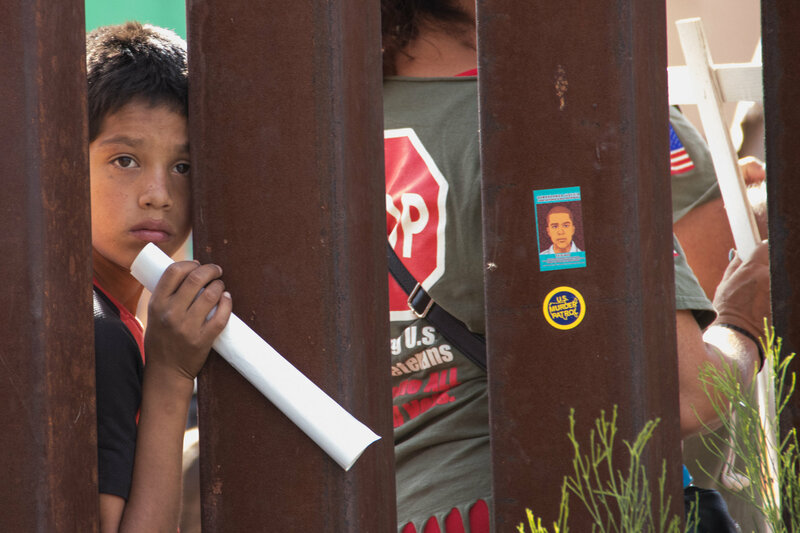 Find in one place all MPI resources related to flows of unaccompanied children crossing the U.S.-Mexico border, including analyses of trends and policy developments; data; country profiles of El Salvador, Guatemala, and Honduras; and MPI telebriefings and events that discuss the latest developments.